Being teachers, Mum and Dad were always available for holidays. 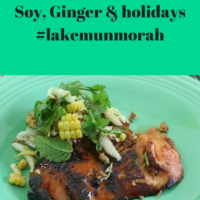 We travelled to many places in our caravan, but one place we went on quite a few occasions was Budgewoi on Lake Munmorah, New South Wales. A pretty place with lakeside activities such as boating , fishing and water skiing. Unfortunately Lake Munmorah terrified us because it was full of jelly fish. So much so that you couldn’t swim in it. With 4 girls Dad found it hard to organise activities that didn’t involve the Lake. He loved the idea of prawning ,and miraculously, prawns managed to cohabit with jelly fish, in the Lake. On several occasions Dad organised prawning trips. He had no sons and so naturally he felt he must encourage us to participate in sporting activities, as you would a son. There was nothing in any way appealing to any of us girls, about an excursion to the Lakeside in the darkness to wade thigh deep through the dark reeds and jellyfish infested waters. Dad thought that we just wanted to sit around and watch TV…….. oh hello we weren’t lazy, just completely terrified of Jellyfish, crabs, fish, seaweed and even prawns ( have you seen their whiskers and what about all those moving legs). A small row boat was launched which we were to hold onto while the nets were unfurled and we were to guide the boat out into the dark water around in an arc with Dad and other men and boys holding lanterns. I suppose this meant that anything alive would swim towards our naked little legs. So what did we do?. Oh well , we screamed and cried and splashed and scared off anything we could, until Dad let us get into the row boat. He wasn’t happy. Inexplicably he tried this on several occasions. I really cant imagine anything Dad may have caught, being as tasty as this fish I have cooked here. In fact, Mum hated fish and prawns , so we definitely would not have eaten this. 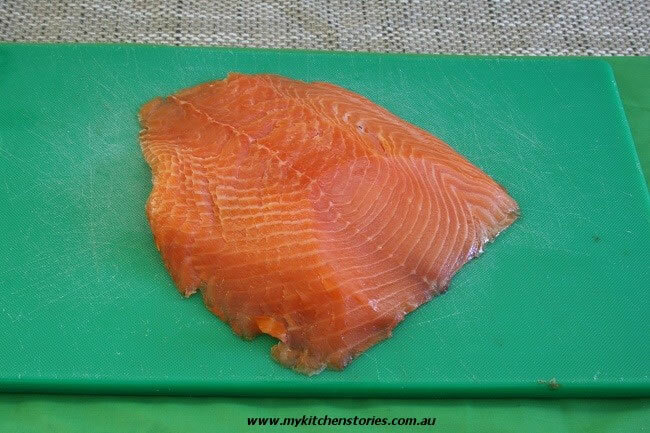 Fortunately making this Roasted Smoked Trout is easy as not going prawning at all….. Put the soy sauces, juice, ginger, coriander and sugar into a bowl and stir well to combine, making sure the sugar dissolves. Remove the fish from the pkt and put onto a baking dish lined with baking paper. Bake for about 15 minutes ( less for thinner fish or smaller pieces. Leave till just starting to turn opaque or crisping around the edges). Mix the cabbage, bean sprouts, herbs and corn in a bowl. Pour over the dressing and toss to combine. No we never went fishing. I don’t think my Dad liked the ‘sitting and waiting” of fishing, the thrill of the prawn was much more his style, unfortunately. Did you ever go Prawning? Are all bloggers from your part of the world great storytellers???? I know of several, whose blogs I have come to love. Yours included. Great story. Nice recipe. Nice recipe. I used to marroning with my Grandad, but was allowed to sit in the boat and help with the nets. I don’t usually eat fish, but I had some ocean trout at a friend’s birthday recently and was pleasantly surprised. 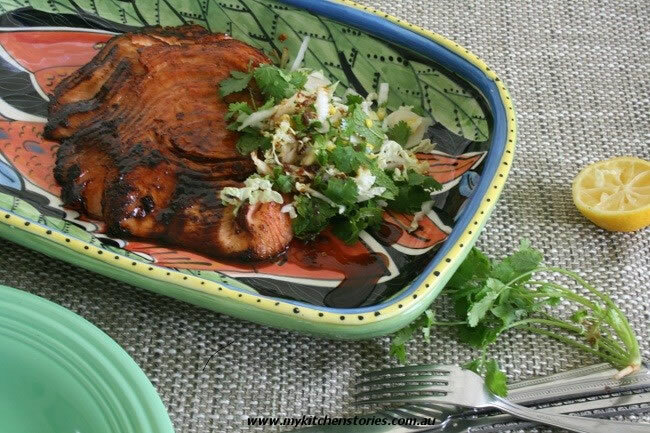 I’ve decided to try to incorporate more fish into my diet, and I think this recipe would be a great place to start. Thanks! My brother loves to go fishing 😉 , but strangely enough that he doesn’t like to eat them…well, at least not as much as I do. 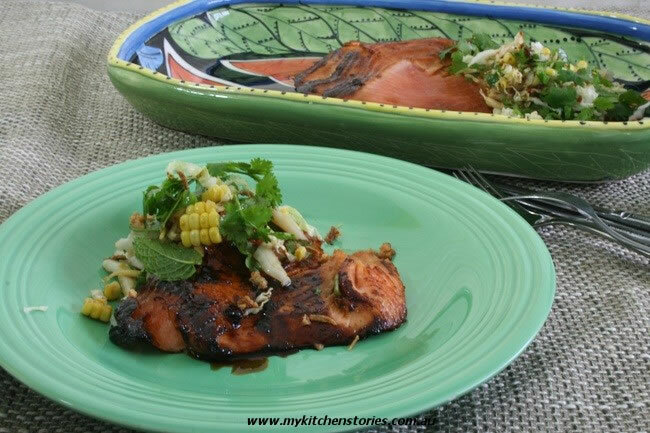 Your roasted trout looks heavenly! How perfect for you, Angie! That marinade looks fantastic! In fact it’s quite similar to the sauce I use in my stir fries. Such delicious flavours. I’m one of five girls so I think our fathers would have a lot of similar stories. 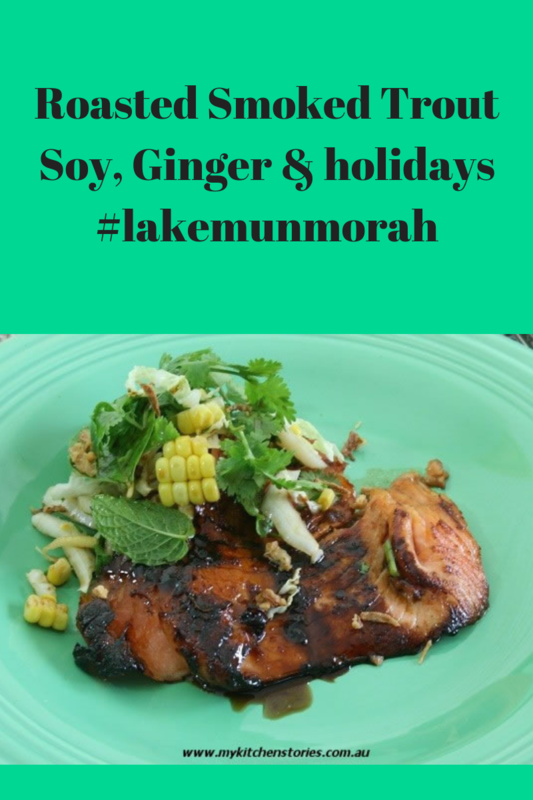 Lake Munmorah is a beautiful part of the world. I didn’t know the lake was full of jelly fish though! And your dish looks delicious. Love how you plated it – so colourful. Ugh you poor thing! I am terrified of jellyfish too! We have quite a lot floating around in the Swan River here in Perth and I can never understand how all those people out there on the water jetski-ing, sailing and rowing can handle it when they fall in!! On a more pleasant note – you dish looks delicious! 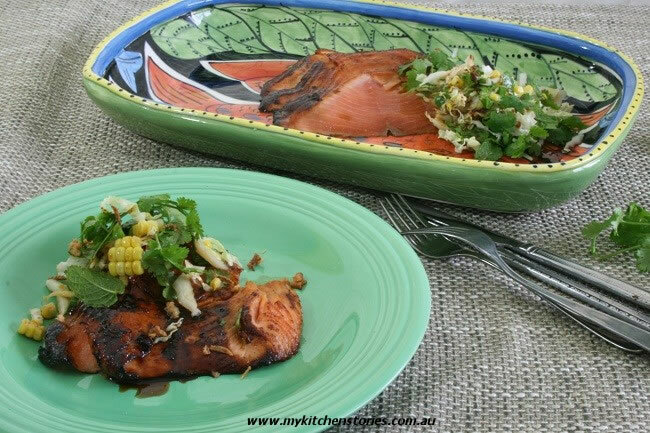 I have a similar recipie where I use the same sort of marinade to make some kebabs using cubes of fresh salmon and prawns…great on the BBQ in summer!